Chronic venous disorders encompass a spectrum of venous diseases, ranging from simple telangiectases (spider veins), reticular veins, varicose veins, and leg oedema to more severe advanced forms of disorders, including hyperpigmented skin changes, dermal sclerosis, and ulcer formation. Part of the spectrum of chronic venous disorders includes varicose veins, oedema, skin changes and ulcers affecting the lower limb, which are categorised as chronic venous disease (CVD). Chronic venous disorders with manifestations specific to abnormal venous function are grouped under the term chronic venous insufficiency (CVI). A distinguishing feature between CVD and CVI is that the latter indicates more advanced forms of chronic venous disorders. Accordingly, CVI includes manifestations such as skin pigmentation, venous eczema, lipodermatosclerosis, atrophie blanche, and healed or active ulcers. Chronic venous disease (CVD), including varicose veins and chronic venous insufficiency (CVI), is an extremely common medical condition that has a significant impact on an individual's health and the healthcare system. Estimates of the prevalence of CVD vary because of differences in the classification or definition used, methods of evaluation, and geographical regions studied. The most common estimates of the prevalence of varicose veins are between 5% and 30% in the adult population, but reports have ranged from <1% to >70%. The prevalence of this condition is higher in developed, industrial countries than in underdeveloped countries. The San Valentino Vascular Screening Project conducted in Italy found a 7% prevalence of varicose veins in 30 000 subjects evaluated by clinical assessment and duplex ultrasound. The rate for the development of varicose veins may be estimated from the Framingham study, which reported an annual incidence of 2.6% in women and 1.9% in men. CVD has a significant impact on healthcare resources. Millions of people seek medical attention annually for varicose veins because of the cosmetic appearance or associated symptoms. Although often underplayed, the cosmetic consequences may adversely affect an individual's quality of life (QoL). An even greater socio-economic impact is seen with more advanced venous disease. Venous ulceration has dramatic consequences that impair an individual's ability to engage in social and occupational activities, reduce QoL, and impose financial constraints. CVD has a significant financial impact on the healthcare system, with an estimated $3 billion per year being spent on the treatment of venous wounds in the USA. In countries with developed healthcare systems, the cost of treating advanced venous disease accounts for 1 - 2% of the total healthcare budget. The estimated prevalence of venous disease in the USA is as follows: varicose veins (>20 million), swollen legs (6 million), skin changes (1 million), skin ulcers (500 000). The most common signs and symptoms of venous disorders are related to telangiectases, reticular veins, and varicose veins. With- progressive dilatation and tortuosity, varicose veins may become painful as a result of venous distention. These veins are also prone to the development of superficial thrombophlebitis, as well as occasional bleeding from superficial veins and thinning of the overlying skin. Common symptoms related to CVD seen by the vascular specialist are pain, swelling, and ulceration of the legs. The pain or discomfort of the affected leg is typically described as 'heaviness or aching' aggravated by prolonged standing and relieved by elevation. Additionally, chronic obstruction of the deep venous system may lead to claudication with intense leg cramping during ambulation because of exertion-induced venous hypertension. Oedema often begins in the foot and ankle and extends up the leg, with progressive worsening during the day as fluid accumulates in a time-dependent manner. Oedema is thought to produce discomfort by increasing intracompartmental volume and pressure. Venous-related skin changes may also develop, including hyperpigmentation in the perimalleolar region secondary to haemosiderin deposition, lipodermatosclerosis with scarring, thickening of the skin secondary to fibrosis in the dermis and subcutaneous fatty tissue, and atrophie blanche characterised by circular whitish and atrophic skin surrounded by dilated capillaries and hyperpigmentation. There is also an increased risk for the development of other skin problems such as eczematous dermatitis, cellulitis, and lymphangitis. Delayed healing of leg ulcers may occur and lead to protracted ulceration. A complete history, including a previous medical and surgical history, is important in evaluating the aetiology of oedema and ulcerations as possible manifestations of CVI. A previous history of deep venous thrombosis or phlebitis, use of anticoagulation therapy, unexplained transient unilateral oedema, or previous venous-related interventions favour a venous aetiology. Similarly, a family history of varicosities, leg ulcerations, or thrombotic disorders supports a venous problem. The venous examination should include an evaluation in both the supine and upright positions to induce maximal venous distention. The surface of the skin is examined for irregularities or bulges suggesting the presence of varicose veins. The distribution of these often follows the course of the affected superficial veins with dilatation of their branches, and palpation may reveal tenderness. Other characteristic skin findings include hyperpigmentation, eczematous dermatitis, atrophie blanche, and lipodermatosclerosis. The oedema is typically pitting, although before the development of overt oedema there may be calf fullness or increased limb girth; therefore both calf muscle consistency and limb girth should be assessed. The appearance of a fan-shaped pattern of numerous intradermal veins on the medial or lateral aspect of the foot or ankle, termed corona phlebectatica (or inframalleolar ankle flare), is thought to be an early sign of advanced disease. The presence of active or healed ulcerations indicates advanced disease. These lesions usually occur in the medial and occasionally in the lateral perimalleolar region at the site of major perforating veins and the greatest hydrostatic pressure. The examination for ulceration should include a detailed arterial evaluation and often a neurological assessment for sensory deficits. A normal pulse essentially excludes arterial insufficiency; however, an ankle-brachial index may be necessary if pulses are masked by oedema. Diabetics often require a limited neurological sensory examination to assess for peripheral neuropathy. Suspicious ulcers of prolonged duration with features suggestive of a mixed aetiology should be biopsied to exclude malignancy. A number of other medical conditions may display clinical findings suggestive of CVD. First, acute venous problems such as deep venous thrombosis need to be excluded. Systemic causes of oedema need to be considered, such as heart failure, nephrosis, liver disease, endocrine disorders, or side-effects of medications such as calcium channel blockers, non-steroidal anti-inflammatory drugs, and oral hypoglycaemic agents. Other regional considerations include a ruptured popliteal cyst, soft tissue haematoma or mass, chronic exertional compartment syndrome, gastrocnemius tear, or lymphoedema. Pigmentation and dermatosclerosis may be mimicked by disorders such as dermatitis, myxoedema, necrobiosis diabeticorum, conditions with increased intra-abdominal pressure, i.e. ascites, and even morbid- obesity. Chronic ulceration may be seen with rterial insufficiency, arteriovenous fistulae, peripheral neuropathies, vasculitides, rheumatoid arthritis, blood dyscrasias, e.g. sickle cell disease, infections, pyoderma gangrenosum, malignancy, trauma, and numerous others. A venous duplex reflux examination (Fig. 1) combines B-mode and colour-flow imaging of the deep and superficial veins and pulsed Doppler assessment of the direction of flow. The standard venous duplex examination assesses for venous thrombosis or obstruction, as well as changes associated with chronic thrombotic disease. In the reflux portion of the examination, direction of flow is assessed with provocative manoeuvres, which may involve the Valsalva manoeuvre or augmenting flow with distal limb compression in the reverse Trendelenburg position. However, the severity of disease as determined by duplex imaging correlates weakly with clinical manifestations. Despite such limitations, the venous duplex reflux examination is considered the mainstay of non-invasive evaluation of CVI. It provides information about the anatomical distribution involving the deep, superficial, and perforator venous systems - useful information to help guide therapy. 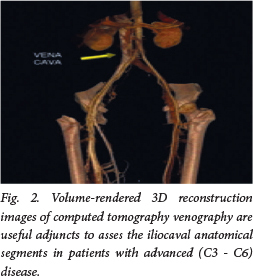 The development of high-resolution computed tomography (CT) with contrast enhancement has allowed extension of its use for the evaluation of venous disease (Fig. 2). 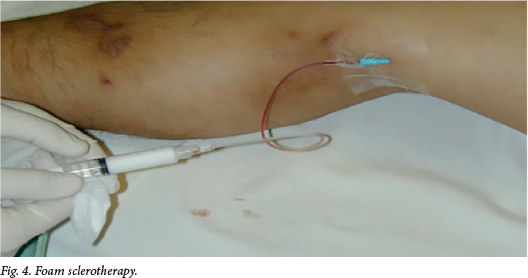 The technique is most useful in the evaluation of centrally located veins and their surrounding structures to assess intrinsic obstruction or extrinsic compression. Optimal imaging of the venous system requires the use of intravenous contrast material with appropriate timing of image acquisition based on venous filling. Abnormalities in venous flow are depicted as filling defects and the correct technique is required to avoid artefacts with inadequate venous opacification. CT may be used to define venous anatomy before considering intervention for CVD. The initial management of CVD involves non-interventional measures to reduce symptoms and prevent the development of secondary complications and the progression of disease. Behavioural measures such as leg elevation to minimise oedema and structured weight loss programmes should be advocated. The use of compression stockings is the mainstay of medical management. If medical measures fail or provide an unsatisfactory response, further treatment should be considered. Specific treatment is based on the severity of the disease, with CEAP clinical classes 4 - 6 often requiring more invasive treatment (Table 1). In addition, early treatment of CEAP class 3 can be instituted to prevent possible progression to advanced CVD classes. Compression stockings should be considered for CEAP classes 2-6. The objective is to provide graded external compression of the leg and oppose the hydrostatic forces of venous hypertension. A number of compression garments are available, including graded elastic compression stockings, paste gauze boots, layered bandaging, and adjustable layered compression. 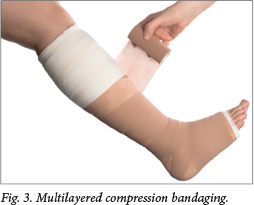 The use of compression bandaging (Fig. 3) and stockings is well established in the treatment of CVD. Treatment with 30 - 40 mmHg compression stockings results in significant improvement in pain, swelling, skin pigmentation, activity, and well-being if a compliance level of 70 -80% is achieved. In patients with venous ulcers, graded compression stockings and other compression bandaging modalities are effective in healing ulcers and preventing recurrences of ulceration. With a structured regimen of compression therapy, 93% of patients with ulcers can achieve complete healing at a mean of 5.3 months. In advanced CVD, skin integrity may be compromised, thus making it important to maintain the health of the skin to prevent skin breakdown and infection. The development of eczematous dermatitis may require treatment with topical steroids. With venous ulcers, controlling bacterial overgrowth with aggressive woundcare may facilitate wound healing. A variety of hydrocolloids and foam dressings are available to manage wound fluid drainage and maceration of adjacent skin. In the presence of an infected ulcer bed, silver-impregnated dressings have been effective in controlling infection and restoring tissue integrity. However, because specific evidence-based guidelines are lacking, there is significant variation in- practice patterns of wound- and skincare management. Four groups of drugs have been evaluated in the treatment of CVD: coumarins (benzo-2-pyrones), flavonoids (2-phenyl-1,4-benzopyrones), saponosides (horse chestnut seed extracts), and other plant extracts. These drugs with venoactive properties are widely used in Europe but are not approved in the USA. The pharmacological action of venoactive drugs increases venous tone and reduces capillary permeability, although the precise mechanism of action of these drugs is not known. Other agents have been used in the treatment of advanced venous disease with ulceration. Several trials have suggested that pentoxifylline may improve healing rates of venous ulcers, but the magnitude of the effect appears to be small and its role in management of this condition is unclear. Although the use of other agents, such as aspirin and platelet-derived growth factor, in promoting the healing or preventing the recurrence of venous ulceration has been reported, no large randomised studies have been conducted. There are no data to support the use of aspirin in the prevention of thrombo-embolic events in CVD. Abnormalities in calf and foot muscle pump function play a significant role in the pathophysiology of CVI. Graded exercise programmes have been used in an effort to rehabilitate the muscle pump and improve the symptoms of this condition. Venous sclerotherapy is the treatment used to obliterate telangiectases, reticular veins,- varicose veins, and saphenous segments with reflux. This may be the primary treatment or used in conjunction with surgical procedures for the correction of CVD. A number of sclerosing agents are available, including a hypertonic solution of sodium chloride (23.4%); detergents such as sodium tetradecyl sulphate, polidocanol, and sodium morrhuate; and other agents such as sodium iodide and chromated glycerin. In general, for smaller diameter veins, the sclerosing agent needs to be diluted to avoid tissue inflammation and necrosis. Sclerosing agents such as polidocanol have been shown to be superior to normal saline in both obliterating incompetent varicose veins and improving venous haemodynamics at 12 weeks. [91 In Europe, sclerotherapy with polidocanol foam under duplex ultrasound guidance has become standard treatment for intracutaneous telangiectases, subcutaneous varicose veins, transfascial perforating veins, and venous malformations (Fig. 4). A common complication of sclerotherapy is hyperpigmentation of the surrounding skin due to the deposition of haemosiderin. The complications of sclerotherapy may be minimised using techniques such as microthrombectomy, using multiple small incisions directly over the thrombosed varicosity to extrude the thrombus. A recent advancement in the treatment of venous insufficiency is the use of thermal energy in the form of radiofrequency or laser treatment to obliterate veins. This technique is frequently used for saphenous vein reflux as an alternative to surgical stripping and for its tributaries as an alternative to phlebectomy. These radiofrequency techniques generate heat, which causes thermal injury to the vein wall and leads to thrombosis and eventually fibrosis. Although radiofrequency ablation is less invasive than surgical stripping, potential complications include paraesthesia, superficial thrombophlebitis, deep venous thrombosis, pulmonary embolism, bruising, skin burns, and infection. Laser treatment with an 810 nm, a 940 nm, or a 980 nm diode has provided excellent results, with saphenous vein obliteration in 93% of cases at 1 and 2 years and no deep venous thrombosis. Both radiofrequency and laser treatment are performed with tumescent anaesthesia, usually a mixture of 0.1% lidocaine in saline, to provide a heat sink, prevent skin burns and reduce pain. Several studies comparing endovenous ablation with conventional ligation and stripping found that the short-term efficacy and safety of ablation and surgery are comparable, although the surgical group had increased postoperative pain and bruising. Both treatments were equally efficaceous in eliminating great saphenous vein reflux, alleviating symptoms and signs of saphenous varicosities, and improving QoL. Endovascular therapy has become an increasingly important means of restoring outflow of the venous system and providing relief of obstruction. Approximately 10 - 30% of patients with severe CVI have a significant abnormality in venous outflow involving iliac vein segments, which contributes to persistent symptoms. Before endovascular therapy, iliac vein stenosis and obstruction causing CVI were treated with surgical procedures such as cross-femoral venous bypass or iliac vein reconstructions with prosthetic material. Because of the success of venous stenting, surgical venous bypass is performed infrequently. 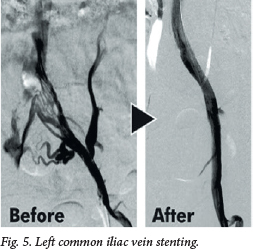 The patency of iliac vein stents (Fig. 5) appears to be good, with a primary patency rate of 75% at 3 years. Close follow-up is advocated to ensure that stent- patency is maintained and early intervention is performed for in-stent restenosis, which occurs in 23% of patients. Surgical options should be considered in patients with CVD refractory to medical and less invasive therapy, including those with persistent discomfort and disability or non-healing venous ulcers despite maximal medical management effort. Invasive and surgical options may also be considered in patients who are unable to comply with compression therapy or have recurring varicose veins. Removal of the saphenous vein with high ligation of the saphenofemoral junction is considered durable and has been the surgical standard for superficial saphenous insufficiency in CEAP clinical classes 2 - 6. In addition, large varicose clusters that communicate with the incompetent saphenous vein can be avulsed during the same procedure by stab phlebectomy. Transilluminated power phlebectomy (or TriVex) may also be used to remove clusters of varicosities with fewer incisions and decreased operative time. Ligation plus stripping of the great saphenous vein results in significant improvement in venous haemodynamics, may eliminate concomitant deep venous reflux, provides symptomatic relief, and assists in ulcer healing. In a study evaluating 500 patients with venous ulcer and reflux of the superficial and deep venous systems, randomisation to surgery (only on the superficial venous segments) plus compression therapy led to a reduction in ulcer recurrence at 12 months compared with compression alone (12% v. 28%) This supports the additional benefit of correcting the incompetent superficial venous system for preventing ulcer recurrence.